Grenade / Tutorial / Hey WordPress, my apps are hungry for XML-RPC! We’ve been quite busy here at Grenade lately. We recently launched a WordPress plugin called WooCommerce Events which allows you to add seamless event and ticketing functionality to your installed WooCommerce plugin for WordPress. Keep an eye on our blog for more information about it coming some time soon! We built a free iOS and Android app which allows you to easily manage your events and ticket check-ins while away from your computer – at your event for example. Since WooCommerce Events is a WordPress plugin, we had to figure out a way in which we could get the apps to communicate with a WordPress site in order to send and receive data to and from it. WordPress makes use of XML-RPC in order to send and receive data. This XML is human-readable and follows a specific structure that a machine will be able to read as well. If you tell the machine you want the name of the second event, it will traverse through all ‘event’ tags until it reaches the second event. Then it will traverse through all the child tags of that event until it finds a ‘name’ tag. It will then return the text value contained within that tag. This will only be possible if the document follows the same established rules for the structure of the data that the machine has also been set up to follow. XML-RPC is XML that follows a standardised set of rules for how data should be represented or structured. This allows various machines to communicate with each other even if they are completely different platforms and codebases eg. a WordPress site coded in PHP with a MySQL database will be able to communicate with an iOS app coded in Objective-C or Swift or an Android app coded in Java. An exchange of data occurs when a client machine issues an XML-RPC request to a server machine for example. The server that receives the request will do some processing based on the data received in the request from the client such as fetching specific data from a database, doing a calculation or just returning some text. The server returns the result to the client via an XML-RPC response. If an error occurs while the server is processing the request, an XML-RPC fault is returned to the client containing information about what went wrong. The fault is returned as structured data also known as an associative array. A structure contains several members, each of which has a ‘name’ tag which is used to access the ‘value’ tag. To get the fault code, the client would access ‘faultCode’ which would return ‘123’. To get the fault string or error description, the client would access ‘faultString’ which would return ‘Event not found’. Requests and responses can contain various datatypes, such as arrays, integers, associative arrays etc. The Wikipedia entry for XML-RPC has quite a nice table showing the various XML-RPC datatypes which you can use to build XML-RPC requests and responses. Phew what a long introduction! At least you have a better understanding now of what XML-RPC is. Now we’re going to take a look at how you can use XML-RPC to establish communication between an iOS or Android app and a WordPress site. You can download the latest version of WordPress directly from their site. Once you’ve completed the very quick and easy WordPress installation on your localhost, make sure you can actually get to the site. Don’t worry about what theme your test site is currently running, we’ll just be working with whichever theme comes default with the installation. When you first install WordPress, it comes with a default ‘Hello World!’ post and a ‘Sample’ page just to get you going. Don’t delete them, as we’re going to be using XML-RPC to access their content. In our XML-RPC request example, we were sending a request to a custom method called ‘getLocationForEventName’. WordPress contains many XML-RPC methods that you can use to access various data on your site. You can see what methods are available in the XML-RPC WordPress API. 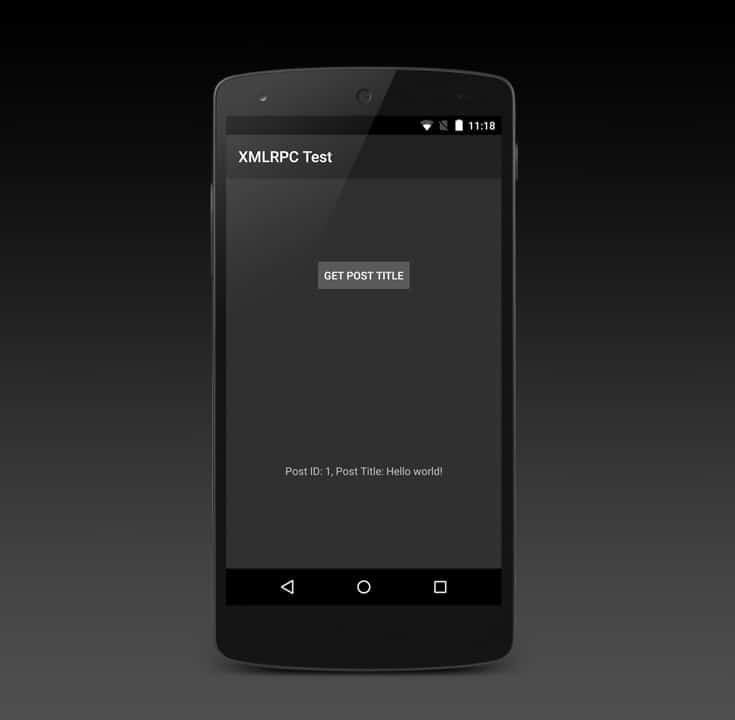 We’re going to be creating our own XML-RPC method to use in our iOS and Android apps. In your currently activated theme’s folder, open ‘functions.php’. It will probably contain quite a lot of code that we’re not going to care about for this tutorial. So scroll right down to the bottom of your ‘functions.php’ file. That is where we’re going to be adding our code. XML-RPC method names should have a prefix in order to prevent method duplication. In our XML-RPC request example, the method name is ‘getLocationForEventName’ and the prefix is ‘xmlrpctest’. We’re going to create a custom XML-RPC method named ‘getPostTitle’ with a unique prefix called ‘xmlrpctest’. It has a parameter named ‘args’ which will contain whichever input is received from the client making the XML-RPC request. 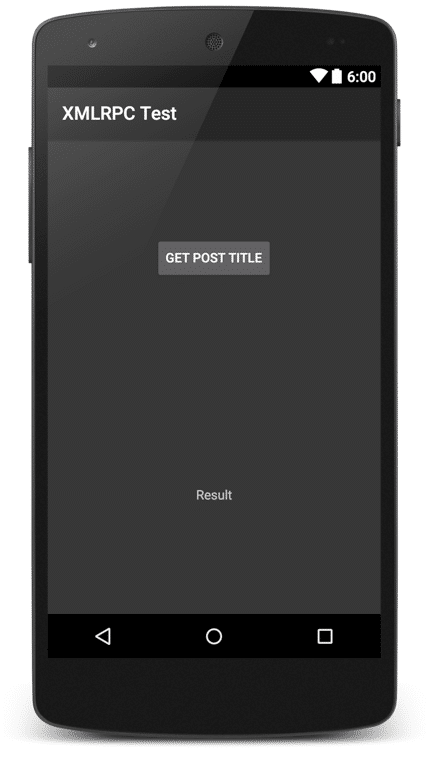 For our example, the method will receive a post’s ID as input and will return that post’s title. I know there are already WordPress XML-RPC methods that do this, but this is just a starting point for creating your own custom functionality that is beyond what the XML-RPC WordPress API can do. As an example, the WooCommerce Events plugin generates unique tickets that each have their own check-in status. We created a custom XML-RPC method that the apps can use to update a specific ticket’s check-in status. It receives the ticket’s ID and new status as input data and then once the ticket’s status gets updated in the database, a response is returned containing information regarding whether or not the update was successful. There aren’t any built-in XML-RPC WordPress API methods that cater to this very specific requirement, which is why we had to build it ourselves. The value sent through to the method as the $args parameter is the post ID which is stored in a $postID variable. Using the built-in WordPress method ‘get_post’, the post with ID $postID is stored in a $post variable. An associative array is returned to the client which contains the post ID value in the ‘postID’ field as well as the post’s title in the ‘postTitle’ field which we got by using the ‘post_title’ property of our $post object. This method adds all your custom XML-RPC methods to the list of available XML-RPC methods available to XML-RPC clients. It receives an array named ‘$methods’ which is the current list of available XML-RPC methods and adds your methods to that array. It then returns the updated list of XML-RPC methods. 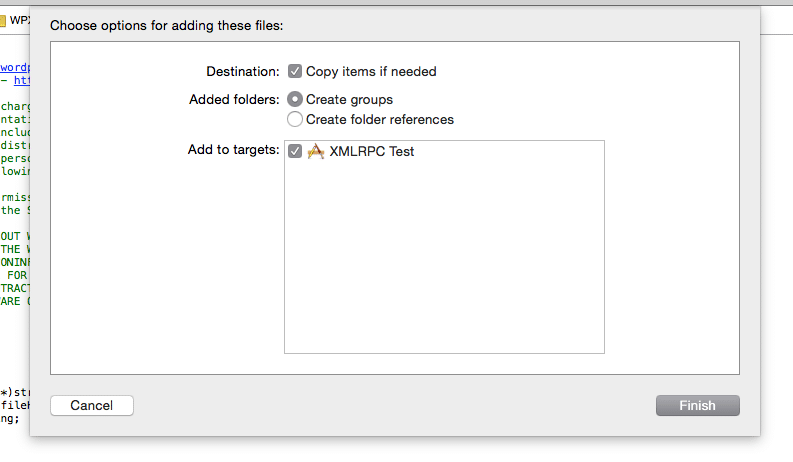 This line tells WordPress to send the current list of XML-RPC methods stored in ‘xmlrpc_methods’ to your custom method ‘xmlrpctest_new_xmlrpc_methods’ which adds your custom XML-RPC methods. For this part of the tutorial, I’m assuming you have a basic working knowledge of iOS app development using Xcode and Objective-C. For this tutorial, I’ve coded a very basic app that we’re going to look at below. 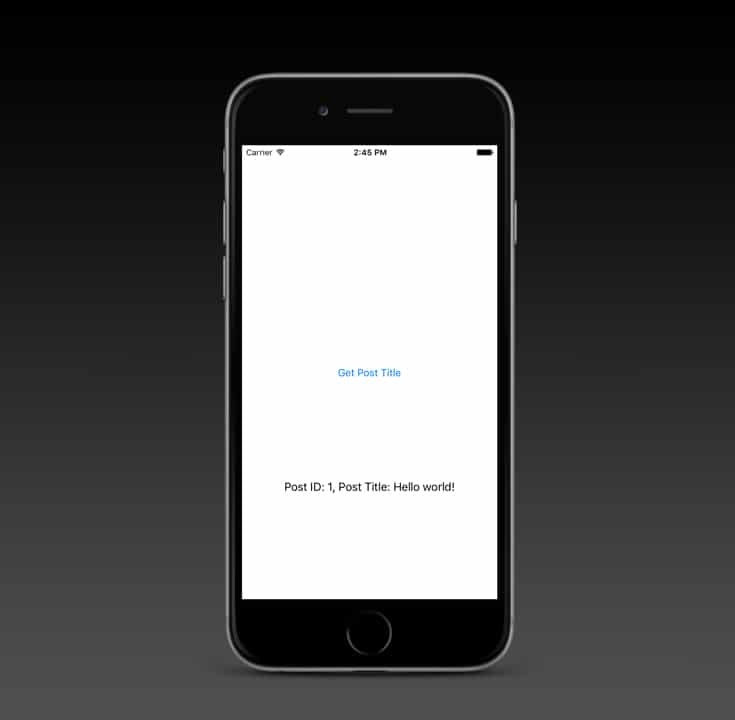 You can either download the sample iOS project or code it yourself from scratch. It could be quite daunting to code your own XML-RPC framework for building properly structured XML-RPC requests and decoding XML-RPC responses to use in your app. There is a very nice lightweight XML-RPC encoder/decoder for iOS and OS X which you can download from GitHub. This is the framework we’ll be using for the iOS part of this tutorial. Create a new Xcode project with a single view. Create a new group and call it something like ‘WPXMLRPC’. Add all the files contained within the WPXMLRPC folder of the extracted zip file you downloaded to the ‘WPXMLRPC’ group. Make sure you check the checkbox next to your target when adding the files and also check ‘Copy items if needed’ to make sure they get copied into your project’s folder. Your app should now compile, but won’t do anything. We first need to create the interface. Once you’ve created and linked all your IBOutlets in the view controller’s header file, open your view controller’s implementation file. This is where we’re going to implement sending an XML-RPC request and doing something with the XML-RPC response that gets returned. 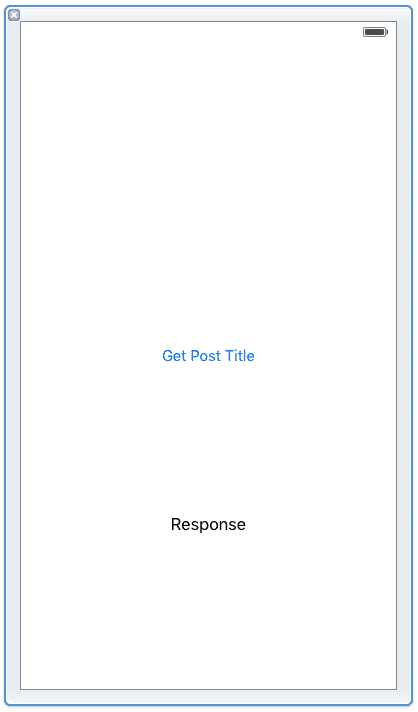 I created an IBAction method called ‘getPostTitle’ and linked it with the button so that when you tap on the button, it will call this method and make an XML-RPC response. You can find the complete implementation of this method in the sample project which contains more code for error handling, but following is the basic implementation of what is required to send and receive data using XML-RPC. The XML-RPC decoder contains an ‘object’ property which contains the decoded data received from the server. Since our custom XML-RPC method returns an associative array, the decoder object will also be an associative array. We can access the returned values by using the ‘objectForKey’ method on the decoder object for ‘postID’ and ‘postTitle’. You can now compile and run your iOS app. If you tap on the button, it sends the XML-RPC request asynchronously to the server. After a short while, the response comes back and the response label’s text is updated to say ‘Post ID: 1, Post Title: Hello World!’. For this part of the tutorial, I’m assuming you have a basic working knowledge of Android app development using Android Studio and Java. For this tutorial, I’ve coded a very basic app that we’re going to look at below. You can either download the sample Android project or code it yourself from scratch. We’re going to be using a lightweight XML-RPC Java library which you can download from GitHub. Then we’re going to set the button’s ‘onClickListener’. If you look at the sample project, you will see it provides a bit more code for error handling. For the sake of simplicity, I’ve removed a lot of code just for this tutorial. The app will give errors saying that required error handling methods are missing etc. and won’t compile. Also, since the interface gets updated after an asynchronous task completes, you will need to run interface updates on the user interface thread, not the background thread. I’ve also removed this code just to simplify the code shown here. Without this code, there won’t be any compile or runtime errors. The interface just won’t update and you’ll spend hours trying to figure out why nothing is happening. If you want to compile and run your app, make sure it has all the code that is included in the sample project. We’re going to create a new XMLRPCClient and initialise it with the URL that the requests should be sent to. You will notice it will be the same URL as the one we used in the iOS app. Then we’re going to start an asynchronous call by providing various parameters. For the first parameter we’re going to create a new XMLRPCCallback object so that we can do something once the server responds with the result of our XML-RPC request. The second parameter is the method name that should be called. After the second parameter, any additional parameters will each be used as separate input data for the method. If there is just one additional parameter, then the $args variable in our WordPress XML-RPC method will contain just that value. If we add two or more parameters, then the $args variable will be an array of values. When the server responds, it returns an Object called ‘result’. We know that our custom XML-RPC method returns an associative array, so we’re going to create a Map object called ‘postData’ and set it to the ‘result’ object which gets casted to a Map object. We can then use the ‘get’ method on the postData Map object to retrieve the value stored for key ‘postID’ and ‘postTitle’. You can now compile and run your Android app. If you tap on the button, it sends the XML-RPC request asynchronously to the server. After a short while, the response comes back and the response text view is updated to say ‘Post ID: 1, Post Title: Hello World!’. What a mouth full! I’m sure the word ‘XML-RPC’ sounds funny now if you say it out loud. If you’ve managed to work your way through this entire tutorial, you should now be able to create your own weird and wonderful custom XML-RPC methods in WordPress, send requests with input data to those methods from your iOS or Android app, and do something breathtakingly incredible with the results. In case you missed it, you can download, compile and run the sample projects I made for both iOS and Android. Please enjoy!